I liked this movie to some degree, but overall it was just kinda bland to me. There were some really great references to movies in this and the voice acting is top notch. It looks phenomenal on bluray. Worth a buy and a watch about once a year if you cannot live without it, but I am sure at some point there will be an ultimate edition of this coming out with more extras. Bee Movie is a comedy that will change everything you think you know about bees. Having just graduated from college, a bee by the name of Barry B. Benson (Jerry Seinfeld) finds himself disillusioned with the prospect of having only one career choice – honey. As he ventures outside of the hive for the first time, he breaks one of the cardinal rules of the bee world and talks to a human, a New York City florist named Vanessa (Renée Zellweger). He is shocked to discover that the humans have been stealing and eating the bee’s honey for centuries. He ultimately realizes that his true calling in life is to set the world right by suing the human race. That is until the ensuing chaos upsets the very balance of nature. It is up to Barry to prove that even a little bee can spell big changes in the world. This is my favorite release this week. I remember watching this growing up and loving every minute of it. It taught me my love for music at a very early age and the images they show the music is nothing short of perfection. I could watch this once a week. It pretty much is the Woodstock of Disney Cartoons. It is packed with extras and you get two films. 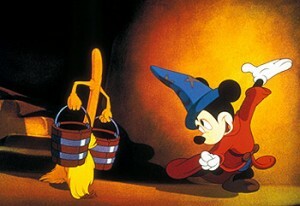 The original Fantasia and the Fantasia 2000. The dreams and visions of Walt Disney come to life in ‘Fantasia,’ which blends music and film magic into an exhilarating movie-going experience. Unforgettable images are brought to life by some of the world’s best music, and highlighted by the comedy of Mickey Mouse as a troublemaking sorcerer’s apprentice, along with the beauty of winged fairies and cascading snowflakes, the majesty of Noah’s ark and even plump hippos performing ballet in tutus. Motivated by his uncle’s foresight, Roy Disney continued the magic with ‘Fantasia 2000’ which begins where its predecessor left off. There are seven completely new segments, and viewers watch a bustling Depression-era metropolis in the style of Al Hirschfeld’s famous cartoons, a flock of flamingos with slapstick yo-yo talents, an ark full of animals gathered by Donald Duck as Noah’s first mate, and musical life breathed into a family of flying humpback whales. I did not get a chance to see this in the theater, but it looked pretty funny. I love Justin Long, Drew Berrymore, and the guy from It’s Always Sunny in Philadelphia, so I imagine I will like this movie. Cannot wait to watch it. A romantic comedy centered on a guy and a gal who try to keep their love alive as they shuttle back and forth between New York and San Francisco to see one another. This movie is BADASS and definitely worth watching. Sadly the hig def transfer is awful and I have no idea if there will be a better one coming out soon or not. One of the most accomplished action-thrillers to emerge in the last decade, Kill Zone features an all-star cast including Donnie Yen, Sammo Hung and Simon Yam in a compelling thrill-ride where two veteran detectives rage war against a secret criminal empire. Now while these films are not as good as the Pixar films or Shrek 1 and 2, they do hold some value. They have heart and some good fun comedy here and there, but they are mainly for the kids. I do like these movies, but if I had a choice, I will always pick Pixar until another company comes along and gets up to par. I am putting both movies under one title. You get the bluray plus the DVD with these movies. Just like with Bee Movie, not sure on the extras. I’m sure there will be a bigger and better release along down the road. In time for the holidays and for the upcoming movie (which is not looking so good) the Ben Stiller comedy films are released on bluray. I did enjoy Meet the Parents and while Meet the Fockers is pretty much the same movie with the same gags, I enjoyed that for what it was as well. It is always great to see Dustin Hoffman in comedy. These movies are funny in their own right, but they just don;t have the replay factor that they once had. Granted, I will watch them again at some point, but who knows. At least these releases have plenty of extras. Like above, I combined these two releases in this one section. I did not get a chance to see this in the theater, but I heard some rather good things about it. I heard it was just a hell of a lot of fun and Nic Cage was actually really good in it. It was a film that both adults and kids can equally enjoy because the characters are very interesting and the action is really great too, which is very rare these days. Looking forward to checking this out. Magic is everywhere in Disney’s The Sorcerer’s Apprentice-the fun family adventure from the creators of National Treasure. Balthazar Blake (Nicolas Cage) is a modern-day sorcerer with his hands full defending Manhattan against dark forces. When a seemingly average kid shows hidden potential, Balthazar takes his reluctant recruit on a crash course in the art and science of magic to become the ultimate sorcerer’s apprentice. Experience more extraordinary thrills, heart-stopping action and spectacular special effects than you can imagine as these unlikely partners show us that the real world is far more magical than we ever knew! This is perhaps the craziest telling of Oz ever!! It doesn’t really work too well, but the music is great. Plus you get Michael Jackson as the scarecrow and Diana Ross as Dorothy. It is a modern urban telling of the tale with some disco chic tunes and dancing. It is a trip to say the least. That is it for this week. Stay tuned for next week for the first week in Decemeber!! Bluray/DVD Releases for the 4th Week of November!!! This entry was posted on Tuesday, November 30th, 2010 at 12:59 pm	and is filed under News. You can follow any responses to this entry through the RSS 2.0 feed. You can skip to the end and leave a response. Pinging is currently not allowed. « Geek Deal of the Day Will Let You Fly On A Battlestar!! !